If y’all are anything like me, you’re shocked at how fast the summer flew by! But, ready or not, here we are…all set to say “goodbye” to lazy days of vacation and “hello” to the hustle and bustle — and excitement! — of a brand new school year! I just wanted to take a moment to introduce myself and welcome everyone back. My name is Audra Snead, and I’m the President of the JES PTO again this year…a job I couldn’t be more thrilled to have! I’m also so excited for the chance to work with our fantastic new team of administrators, Dr. Moses, Mrs. Williams, and Ms. May. Their energy and enthusiasm is contagious, and we already have plans for many exciting things for our students and families this year. 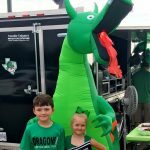 Thanks to our wonderful and supportive parents, and our dedicated teachers and staff, the Johnson community is one that is tirelessly devoted to the well-being of our little Dragons, and I feel so fortunate to be helping lead the charge for a year full of programs and events driven by our PTO and its countless volunteers (which we hope will include YOU!). I invite you to take a look around our website and learn more about all that the PTO does to not only support our teachers and staff in their work with our kids each day, but also to create community among our students and their families…they say it takes a village, and it certainly does. Welcome to OUR village, and we look forward to working with you to make this a year to remember!